This post is personal. Years ago I came to a fork in the road with respect to my career. As I wrestled with my options I began to think about what should and should not drive my decision. At that point I jotted down nine decision-making factors I needed to consider. Over the years I have added to my list. This post is the result of that thinking. At the end of the day leaders are decision-makers. Yet it often seems easier to make decisions when they are organizational rather than when they are personal, especially when it comes to determining the best place to exercise one’s servant leadership. In this post I examine seventeen decision-making factors leaders need to consider when they come to a fork in the road. 1. FEAR should not drive my decision. Jim Whittaker, the first American to climb Mt. Everest said, “You never conquer mountains. You conquer yourself—your doubts and fears.” I know unhealthy fear is driving my decision when I start asking questions like: “What will other people think if I do this or that?” There is good reason that the most often-repeated phrase in the Bible is “Fear not.” God does not want us to be driven by fear, but by the certainty of his love and care. 2. PRIDE should not drive my decision. Parker Palmer wrote a great book entitled, Let Your Life Speak. In it he describes a time when he considered taking a presidential post in an educational institution. Friends pressed the “Why” behind his desire. Palmer hemmed and hawed, and then in a moment of raw transparency he said, “Well, I guess what I’d like most is getting my picture in the paper with the word president under it.” As he explored the “big why” behind his decision he found self-aggrandizing pride. That was all he needed to get off the presidential path. 3. SERVICE should drive my decision. Al Mohler has said, “Leaders lead, but they do this knowing that they are leading on another’s behalf. Leaders—no matter their title—are servants, plain and simple.” Once I understand that the essence of my leadership is service, then a key question becomes: “Where can I leverage my leadership to serve God and others the best?” Answering that question helps me to know the path to take when I come to the fork in the road. 4. S.H.A.P.E. should drive my decision. The S.H.A.P.E. acrostic stands for Spiritual gifts, Heart, Aptitudes, Passions, Experiences (click here for more on SHAPE). Every leader has a unique SHAPE. What is yours? Paul, a man with a powerful impact and an amazing legacy, wrote: “I say to everyone among you not to think of himself more highly than he ought to think, but to think with sober judgment, each according to the measure of faith that God has assigned.” When I come to the fork in the road I have to discern which path is more in keeping with my unique SHAPE. 5. SHORTCUTS should not drive my decision. Taking a path because it is easy or because it promises a “fast-track” to more money, power, or prestige is really a shortcut to failure. Excellence in any endeavor is the by-product of hard work. 6. OPPORTUNITY is a factor, but not a good driver in my decision. Opportunities will come to those who excel at what they do. God reminds us, “Do you see a man skilled in his work, he will stand before kings, he will not stand before obscure men” (Proverbs 22:29). Every opportunity is not necessarily God’s open door. Every need is not necessarily God’s call on my life. I have found that the opportunities that bear serious consideration are those that coincide with a unique season in my life and that call for my unique gifts and talents. 7. UNITY with your spouse is critical to the decision. Amos, the ancient biblical prophet asked, “Do two walk together, unless they have agreed to meet?” Unity—especially unity in the family—is essential to a good decision. Ignoring the wisdom and warning of a spouse can prove hazardous. Not only is there a greater potential for bitterness to take root, but the leader misses out the wisdom of one who usually knows the leader and his/her blind spots best. 8. WISE COUNSEL should guide my decision. What do wise friends and mentors have to say about your options? Have you asked them: “Do you think this role is a good fit for me?” “What questions am I not asking?” “Tell me what I don’t want to hear.” The writer of Proverbs says, “In an abundance of counselors there is safety” (Proverbs 11:14). 9. STEWARDSHIP should drive my decision. “A steward is someone who manages and leads what is not his own, and he leads knowing that he will give an account to the Lord as the owner and rule of all.” In the parable of the talents, Jesus tells us that the steward’s job was to multiply his talents. When I come to the fork in the road I have to ask myself which path will enable me to best multiply the talents God has given me. Multiplying talents may lead me on a path away from family, “financial security,” and popularity. As a friend recently reminded me, “Any time you are going to multiply your talents, it is going to involve risk.” Savvy stewardship means taking that risk. 10. DESIRE should influence, but not drive my decision. “What do I want to do?” That is a question that every leader must ask. Life is short. Spending it doing something you dislike is a waste of a life. God has given you a brain and desires. Where are those desires leading? Desire is often a strong God-given indicator of the path we should take at the fork in the road (Psalm 37:4; Proverbs 16:1-3; Philippians 2:12-13; Deuteronomy 14:26). At the same time, we must recognize that our desires often tilt toward the easy, the safe, the self-serving, and the comfortable (Jeremiah 17:9). 11. PEACE should be a factor, but not the driver in my decision. Some people will say, “Well, I have a great peace about this move,” as if that were the divine stamp-of-approval on the decision. Many leadership greats—both inside and outside of the Bible—did not have great peace about the path they were taking. In fact, they knew it would be hard, lonely, and unpopular. At the same time, peace comes when we are moving in the direction we know we should be moving. 12. FINANCES should factor in my decision. Finances are always a poor sole determiner in deciding which path to take at the fork in the road. Money buys a lot of things, but it most certainly does not buy happiness. At the same time, if walking one path puts me or my family in financial peril – beware. 13. VISION should drive decision. Steve Jobs legendary pitch to John Scully, “Do you want to sell sugar water for the rest of your life or come with me and change the world?” speaks to the power of vision. 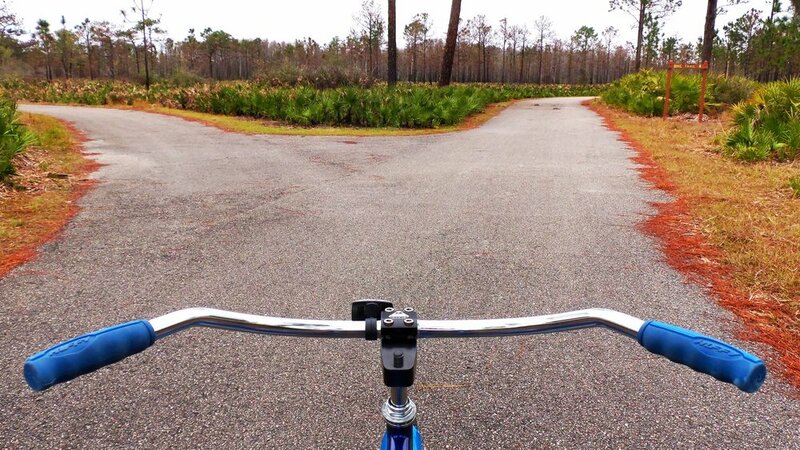 When I come to the fork in the road, which path offers the greater vision? 14. SEASON should factor in my decision. The right opportunity matched to the wrong season in life equals pain and suffering. Leaders must be attuned to their season of life: Age (Do I have the energy to do this? ), Family (Will this opportunity rob me of family time I can never recover? ), Experience (Am I jumping into waters for which I am really not prepared to swim?). I have learned to assess my current life season when it comes to the fork in the road. 15. CONVICTIONS should drive my decision. Do my values and convictions align with one path more than the other? Imagine a set of train tracks that are one degree off alignment. There would be little noticeable difference for the first few feet, but over time the difference would lead to tension and derailment. New opportunities are enticing. I cannot let the thrill of the new blind me to the danger of being out of alignment on values and convictions. 16. CHEMISTRY should drive my decision. In Good To Great, Jim Collins talks about the importance of getting the right people on the bus. This is great wisdom. The “right people” includes the right chemistry among those people. For my part, I have to love the work I do and I have to enjoy working with my teammates on the bus. If I don’t sense that chemistry, I am not going to jump on for the ride. 17. THE SPIRIT’S LEADING should drive my decision. As the leader stands at the fork in the road, he or she has to ask, “How do I sense God’s leading at this juncture?” This is not always easy to discern. At times I will take an item, say a book, and let it represent my opportunity at this fork in the road. I’ll hold it in open palms before God and pray, “Lord, whatever you want.” At times, God will give a strong sense of “No.” At others, a strong “Yes.” And sometimes either opportunity gets the “green-light” from God. The important point for me is to hold my desires loosely before Him. God says, “The wisdom of the prudent is to discern his way” (Proverbs 14:8). Discernment takes time. It takes prayer. It takes honest assessment and a few good friends to help discover and apply the wisdom of God. Servant leaders take that time. QUESTION: What decision-making factor would you add to this list? I’d love to hear from you on that. You can leave your comment below. Parker Palmer, Let Your Life Speak: Listening for the Voice of Vocation. San Francisco, CA: Joosey-Bass, Inc. 2000. Page 46. Al Mohler, “Leaders lead, but …” from The Conviction To Lead: 25 Principles For Leadership That Matters. Minneapolis, MN: Bethany House Publishers. 2012. Page 136. “Do two walk together” from Amos 3:3 ESV. The definition of a steward comes from The Conviction to Lead, page 135. Steve Jobs to John Scully from Monica Chen in Triangle BizBlog, “Scully on Jobs’ ‘sugar water’ legend.” www.bizjournals.com September 16, 2011. Accessed October 22, 2013. The concept of convictions driving decisions came from The Conviction To Lead by Albert Mohler. “The right people on the bus” … Jim Collins, Good To Great. New York: HarperBusiness, 2001. Page 13 et al.